Greater Fool Theory - What Does It Mean? 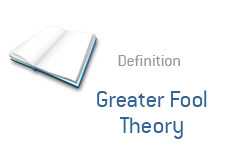 What does "greater fool theory" mean? What is the definition of the "greater fool theory"? The "greater fool theory", as it applies to the stock market, is usually referenced in regards to securities that are deemed to be overpriced. Why would an investor purchase an asset that they deemed to be overvalued? The "greater fool theory". The "greater fool theory" says that as long as there is a bigger fool that will buy at a higher price than what you paid for a security, than investing in an "overpriced" security can prove to be a profitable venture. The "greater fool theory" is best illustrated through an example. Example: An investor purchases 1,000 shares of Amazon.com (AMZN) at the height of the dot-com boom, despite the fact that they feel as though the shares are extremely overvalued. Why would they buy these shares if they feel as though they are overvalued as it is? Because the investor feels as though the shares will continue to trade higher, and that a "greater fool" will buy the shares at an even higher price. This is the "greater fool theory". The closer we are to an absolute top in the market, the more "fools" there will be.